The Grim Connection Between Two Sensational Pieces From The New Yorker, Published Nearly 70 Years Apart. The Lottery by Shirley Jackson was published in 1948 and was an immediate sensation. 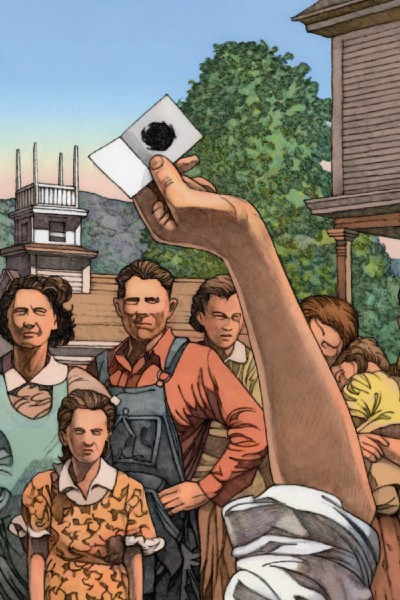 The Lottery by Shirley Jackson was first published in 1948 in The New Yorker. It’s hard to overstate the impact this story had when it was published. The story caused a worldwide outcry upon its release. The New Yorker faced a PR crisis, with thousands canceling their subscriptions and their offices flooded with angry letters. The entire nation, and then the entire world, was talking about this story in the second half of 1948. One nation (South Africa) enacted a national ban on the story within its borders. The Lottery is about a strange ritual in an American small town. The townsfolk gather and heads of households draw slips from a ballot box. The Hutchinson family draws a slip with a black spot on it. Now the Hutchinsons, having drawn the slip with the black spot, move on to the second round of the lottery alone. The genius of The Lottery is in the way Jackson gives us clues that something serious and dreadful is afoot, but forces us to keep reading to find out what it is. Reading The Lottery is an experience in anxiety and dread, especially as the Hutchinson family, and the townsfolk around them, all start to get nervous about the makeup of Bill Hutchinson’s family. It’s Bill, his wife, and three children. If you haven’t read The Lottery in full, be warned that a discussion of the ending of The Lottery, with spoilers, is at the end of this piece. But before we get there, we need to talk about The Lottery’s relevance to America in 2018. We need to talk about the mob. 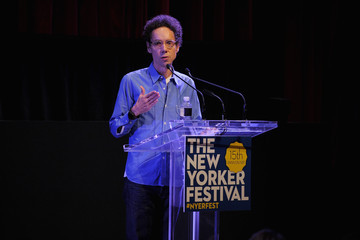 Malcolm Gladwell giving a talk at The New Yorker Ideas Festival in 2014. “School shootings” is a phrase we now use in American life. We have a phrase for it because it keeps happening. It is a recurring phenomenon with distinct characteristics, and it keeps happening. Malcolm Gladwell wasn’t the first to describe school shootings as a phenomenon with its own set of rules and rituals, but he became the most notable for doing so, because when he did, in a 2015 New Yorker article titled Thresholds of Violence, he predicted, correctly, that they would accelerate. The “riot” was a central motif in Gladwell’s piece. He argued that the same human psychology that comes into play when riots happen is the one that is driving the accelerating frequency of school shootings. Gladwell’s thesis, based on the work of sociologist Mark Granovetter, is that most humans have thresholds that must be crossed before they are willing to engage in aggressive behaviors. “Thresholds” in this case are defined as the number of people we must see already engaged in an activity before we decide it’s okay to join them. Granovetter’s research showed that, while you may be willing to sit out or even condemn acts of aggression if you see one or two people engaged, your attitude starts to change as more people enter the fray. With each new person you see joining an act of aggression, your own “threshold” for aggression drops. Granovetter argues that individuals have different thresholds (some people are quick to join a riot; some never will), and that within individuals, there are different thresholds for different acts (someone who is fast to join a Twitter mob might be slow to join an actual mob, or vice versa). But crucially, what Granovetter’s research shows is that numerical thresholds are real, that our perception of when it is okay to be aggressive or even violent changes as we see others engage in aggression or violence. Gladwell argued that school shootings were becoming a “slow-moving riot,” not so much because they looked or felt like a traditional riot, but because the underlying psychology was the same. Gladwell looks carefully at the growing list of school shooters, starting in the mid-1990s and continuing into 2015, and sees a pattern of ritual and self-reference among them. The shooters are clearly, without question, paying close attention to one another, each new shooter both mimicking those who came before and adding new twists, the whole of it a growing and rapidly evolving act of group violence, just like a riot. But unlike a traditional riot, this one doesn’t burst out quickly in the streets as joiners see their own thresholds pass quickly in real-time, but rather, slowly, in the media, as the whole nation watches, and a disparate group of young men with uniquely low thresholds for exactly this kind of ritualized violence see their own thresholds pass and decide to join in. Worse, with each shooting that happens (and importantly, gets wall-to-wall coverage across all media), a new threshold is crossed. The next young man who does this will have a higher threshold for violence than the last, but he’ll do it anyway, because ever-higher thresholds get crossed as the riot keeps going. That uncomfortable reality made for a grim prognosis at the end of Gladwell’s piece. He predicted that, more and more, the people we saw participating in this kind of ritualized mass murder would look less and less like the classic psychopaths we saw in the 90s. The problem is that the riot keeps growing. Granovetter’s research on riot psychology supports the larger psychological concept of deindividuation. Deindividuation, a concept from social psychology, is a recognition that an individual’s behavior is markedly different when she is a member of a group than when she is alone. Psychological deindividuation is marked by decreased self-evaluation and decreased evaluation apprehension. It’s about how, when you’re in a group, you often give over much of your individual decision-making process to the group. How when you’re in a group you are, psychologically, not the same person you are when you’re alone. 2018 feels like the year when America had to come to terms with this basic psychological truth: When you’re in a group you are, psychologically, not the same person you are when you’re alone. We didn’t fully appreciate how profound group dynamics are when we all moved, together, into social media. Social media is about our need to be part of a group. On Facebook we join a group of friends and family. On Twitter we join politically like-minded tribes. On Instagram and Youtube we put ourselves out there and embrace whatever groups envelop us. And we behave differently than we do when we’re alone. As members of groups, we have decreased evaluation apprehension so we’re much more likely to be taken in by fake or exaggerated news that supports the stories and aims of our tribe. We have decreased self-evaluation so we’re less likely to even consider that we’re in a tribe and behaving tribally when we share fake news or join in a shaming mob. As individuals, we have thresholds that must be crossed before we do something aggressive like try to get a stranger fired from his job, but as members of groups, we blow past those thresholds with ease. If our threshold to Retweet an act of aggression at a stranger is a hundred Retweets we don’t hesitate to click a button that Twitter tells us, quite plainly and precisely, has already been clicked 1,500 times. We knew this was happening as early as 2013 when we watched the Twitter mob (or even watched ourselves acting within the Twitter mob) decide that a PR specialist named Justine Sacco, who made a racist joke after boarding a plane bound for Africa, not only needed to be corrected, but needed to be shamed, and not only needed to be shamed, but needed to be humiliated, and not only needed to be humiliated, but needed to be utterly and permanently destroyed, her career ended, her reputation smashed, her name infamous. A simple hashtag that seemed amusing and funny to its initial Retweeters quickly became the height of aggression as thresholds got crossed, with each new person who added to the fray aware on some level that they were now participating in the ruination of a total stranger simply because she made a 140-character joke on Twitter, but doing it anyway, because our behavior inside a group is different than our behavior as individuals. Inside the group, if our threshold has been crossed, we give over self evaluation of our actions to the group. We allow the group to determine how we should behave. It’s worth noting that deindividuation, in itself, isn’t necessarily a bad thing. The examples above are all of the dark side of deindividuation, but the same phenomenon is responsible for incredible amounts of productive, positive human behavior. Humanity’s most extraordinary achievements, from the skyscrapers in our cities to the miracle computers in our pockets to the ample food in our refrigerators have all come about because of our ability to cooperate, and deindividuation is a part of our psyche that makes cooperation possible. Deindividuation is also a part of us that can bring great joy and personal fulfillment to our lives. Every time you’ve felt an overwhelming sense of camaraderie and belonging, every time you’ve felt so strongly for someone else you’d be willing to die to protect them, you are feeling the effects of deindividuation. Many of us (the author included) seek out moments of extreme deindividuation like rock concerts where, four or five songs in and firmly entrenched in the mosh pit, you get a uniquely exhilarating feeling, the feeling that you would gladly start talking in tongues if the band leader asked you to. There is something deeply human, deeply a part of us, that creates these group dynamics. And, as we’re all too painfully coming to recognize, it is the absence of positive deindividuation that makes some young men so susceptible to the negative deindividuation of the school shooting riot. The more we profile these kids, the more we see that the defining commonality among all of them is a bitter detachment from and resentment towards the camaraderie of their peers. We like to say that humans are social animals, but it’s more than that. Humans have the mob mentality. Humans have thresholds that get crossed and then they join riots. Humans live and function in groups, and their psychology is so heavily influenced by the group that they are functionally different organisms when in the group than when alone. Which brings us back to The Lottery by Shirley Jackson. The most terrifying aspect of The Lottery, the reason it caused a sensation when it was published, is because, by the time we get to the end, horrible and terrifying as it is, we completely believe it could be true. We know ourselves. We know what we’re capable of. 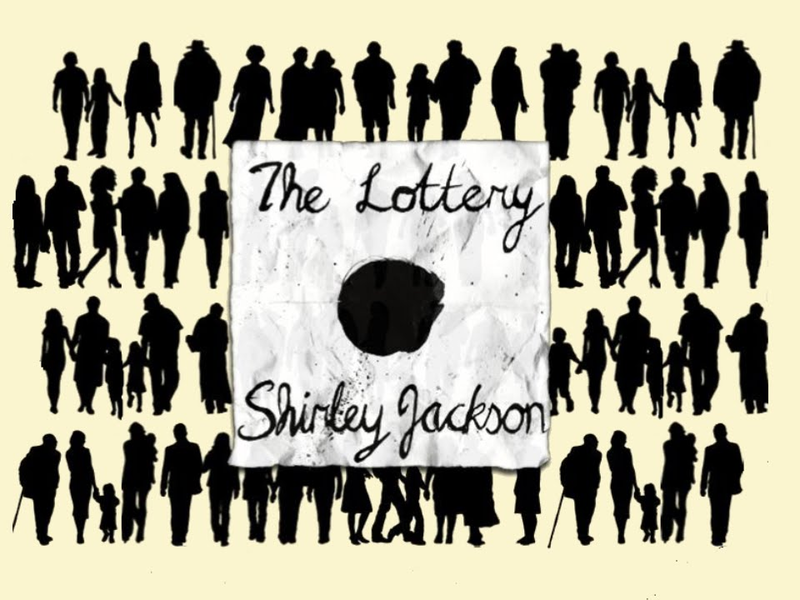 In The Lottery, Shirley Jackson invited us to take a long, hard look. If we don’t like what we see, and we shouldn’t, it’s our job to ask ourselves how we can be different. How can we leverage our understanding of the psychology of groups to bring out more of the good (skyscrapers and ample food and rock concerts) and less of the bad (aggression and violence and mass murder)? A first step is to recognize that the potential for evil is there in all of us, and we engage with it a little bit every time we allow our self-created social media mobs to deindividuate us. Bill Hutchinson and his wife, Tessie, must also pull slips of folded paper from the ballot box. As all this happens, Shirley Jackson lets us hear the whispers in the crowd, lets us see their nervous, shifting eyes. Tessie, the mother of three young children, pulls the paper with the black spot on it. Despite causing a global outrage and the mass cancellation of thousands of New Yorker subscriptions, The Lottery is now rightly considered one of the most important American short stories ever written. Old Man Warner was saying, “Come on, come on, everyone.” Steve Adams was in the front of the crowd of villagers, with Mrs. Graves beside him. “It isn’t fair, it isn’t right,” Mrs. Hutchinson screamed, and then they were upon her.